With straight cutting canola gaining ground in Western Canada, more research is underway. But growers need to be aware of the unique storage challenges that often come along with straight cutting canola. Whether straight cut or swathed, aerate and monitor canola once it goes in the bin. Photo by Bruce Barker. Straight cutting canola is becoming more popular across the Prairies, partially because of gains in harvest efficiency. 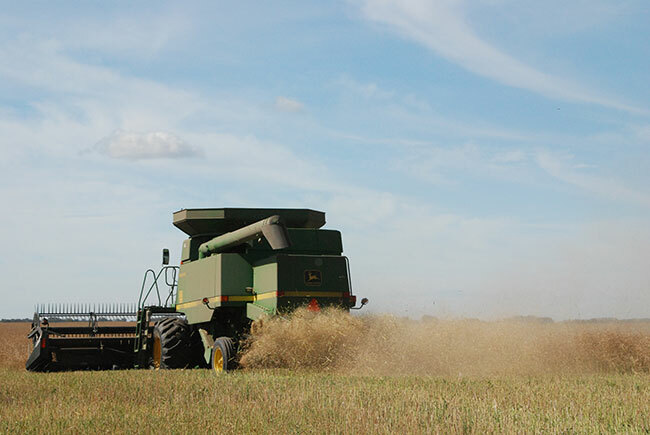 Research by PAMI in Portage la Prairie, Man., found that straight-cut canola was often as profitable as swathing and combining. However, one area that canola growers need to be aware of is that straight cutting canola can pose some unique, although not unmanageable, storage issues. A challenge with green plant material is that it typically moves to the outer walls as the bin fills, and is susceptible to heating and development of mould. Surprisingly, during the drawn-out harvest of 2018, Bender didn’t have much problem with green plant material. Because harvest was delayed and he harvested wheat first, the standing canola had time to dry down. moisture content than swathed canola. “Swathed canola generally dries down more uniformly so moisture content at harvest can be as low as six to seven per cent. When we straight cut canola, it is often close to 10 per cent, so we always aerate to condition the grain to prevent heating,” Bender says. A one-year study led by Lorne Grieger, program manager with PAMI, in Portage la Prairie in 2017, evaluated differences in storability of canola seed harvested by swathing, straight cutting with glyphosate, straight cutting desiccated with Reglone, straight cutting desiccated with Heat LQ and glyphosate, and straight cutting that was left to ripen naturally. The research was part of a larger study on straight cutting canola funded by Growing Forward 2. Samples were taken from each treatment and sent to a lab for a third party analysis of green seed, dockage, oil content, moisture, and seed weight. There were no differences in dockage, green seed, oil content or bushel weight between treatments. Seed moisture content and thousand kernel seed weight were significantly different between swathed and other treatments. Swathed canola was about one per cent lower in moisture content and seeds were smaller than the other treatments, except for glyphosate straight-cut canola, which had similar seed size to swathed canola. Additional samples were sent to the University of Manitoba for respiration testing under the direction of Dr. Fuji Jian. Respiration rate was estimated by measuring the CO2 concentration built up over three days when stored at one of four constant temperatures: 20 C, 25 C, 30 C, or 35 C. At the end of three days, the air was exchanged and the process repeated over 10 weeks. The preliminary results of the one-year study were not conclusive when comparing swathed to straight cut canola respiration rates. However, storage temperature had a strong effect on respiration rate at temperatures of 30 C to 35 C compared to 20 C for all treatments. Unfortunately, the PAMI study did not receive funding to carry on the research into 2018. But the trend of greater respiration at higher temperatures certainly highlights the current canola storage recommendation – swathed or straight cut – to immediately cool down the canola to help prevent heating. Canola Council of Canada recommends that canola should be binned at a maximum of eight per cent moisture and cooled to 15 C or lower throughout the bin. Can straight cut canola work?